A view of the strainer when removed from the teapot. Photo: David H. Ramsey. Gary Lee Noffke is a complex person who cannot be pigeonholed. He is often described as a metalsmith’s metalsmith, a pacesetter, and the “ultimate maverick.”[i] Although Noffke has often gone against the grain, he is widely acknowledged as one of the foremost metalsmiths in the United States. Since the 1960s, this consummate artist has devoted himself to his material of choice, metal. 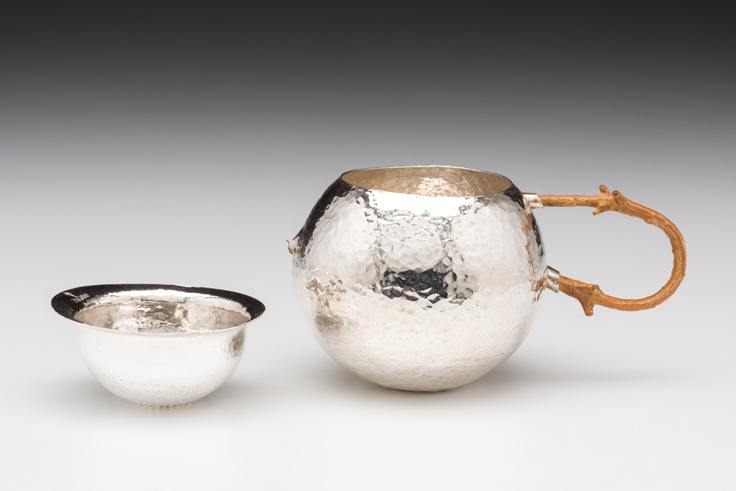 Predominantly working in silver, gold, copper, and steel, he has consistently created jewelry, hollowware, and flatware passionately exploring surface, form, and function. He is best known for his rich expressive surfaces as well as his technical prowess, hot forging research, development of numerous alloys, and certainly his rare ability to embrace and challenge tradition. The renowned metalsmith Brent Kington has been an influential figure for Noffke. He studied under him at Southern Illinois University in Carbondale, receiving a Master of Fine Arts in 1969. Kington deepened Noffke’s exposure to metalwork from ancient to contemporary times and encouraged experimentation, particularly on surface treatment and how to finish a work. Noffke says Kington “had a dislike for shiny, clean, perfect nothingness seen in the surface of any form of metal.”[ii] This was most likely in reference to the flawless appearance of Scandinavian modern designs. He remembers his professor saying that one scratch on the surface of those perfectly executed works destroyed their intent. Not until they had years of use did they have any character. [iii] Kington gave Noffke the freedom and encouragement to attack the surface expressively and do what was natural to him. The lessons he learned during those years at Southern Illinois University had a lasting impact. For anyone who has ever had the pleasure of witnessing Noffke work, you know that he moves quickly with great energy and spontaneity. As Jeannine Falino stated in his 2011 retrospective catalogue, “To see [Noffke] wield a hammer is to witness a brilliant choreography of motion that recalls the drip paintings of Jackson Pollock.”[iv] Operating from his gut rather than a formula with preconceived results, he is not afraid of making mistakes and often pushes the metal to its brink. Sometimes this means even “trying to lose control over things so it doesn’t look like it is made by a machine.”[v] Noffke has no desire to create tight, highly polished forms that conform to the European traditions of silversmithing. Instead he wants you to experience that making process and to see and feel the hammer marks. These are objects that have a sense of history and are often very personal in nature. It does not matter if it is a baby spoon or a gold ring, Noffke wants his work to be used and worn. He likes the fact that this further adds to that object’s sense of history. A view of the spout. Photo: David H. Ramsey. A view of the marked rim. Photo: David H. Ramsey. Within the Kamm Teapot Foundation there is an impressive Noffke silver teapot, the only example of this form he has ever created. It reflects many characteristics seen in Noffke’s work. Conceived with no predetermined plans or sketches, this simple bulbous structure has a flanged rim encircling the top opening. A c-shaped, steamed, boxwood handle, attached with 18 karat gold rivets, projects from the its surface. Unlike traditional examples, it contains no lid. Inside the teapot rests a strainer with hand punched holes for loose tea. 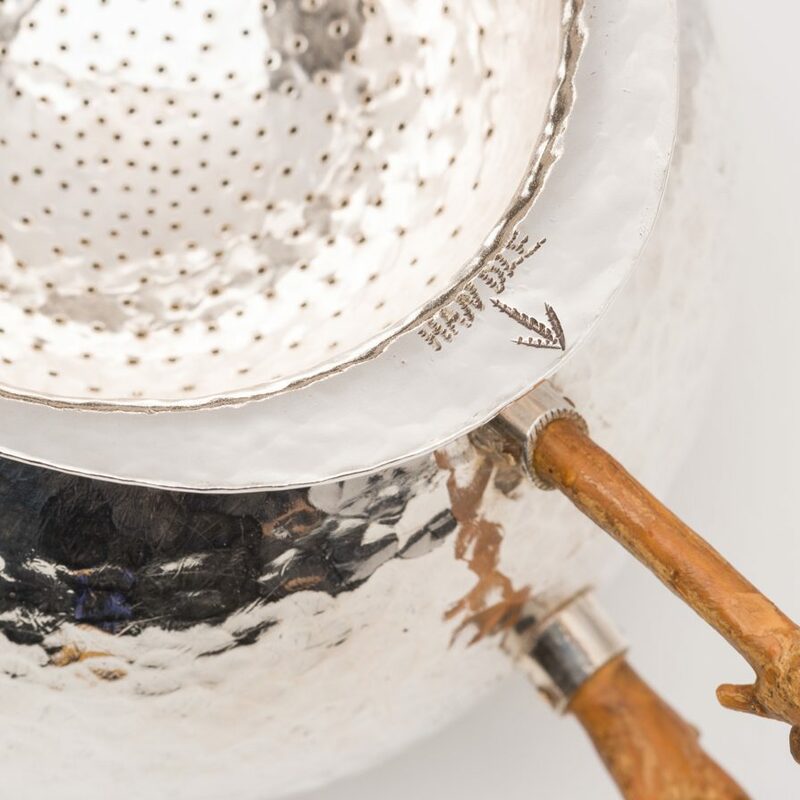 An engraved arrow on the strainer’s edge illustrates its correct positioning. The “spout”, or lack of spout, is striking. Noffke says he has always disliked the look of spouts and their awkward protrusion from the body of a teapot. Therefore, he used a large punch and just boldly broke through the side of the form. This decision, Noffke believes, produced an aesthetically pleasing and more effective pouring solution. The surface of the teapot was finished with a planishing hammer and polished. However, Noffke’s goal here is not to hide the presence of the tools he utilized or to imitate machine produced forms. As you examine the work, you still see evidence of the maker’s hand. 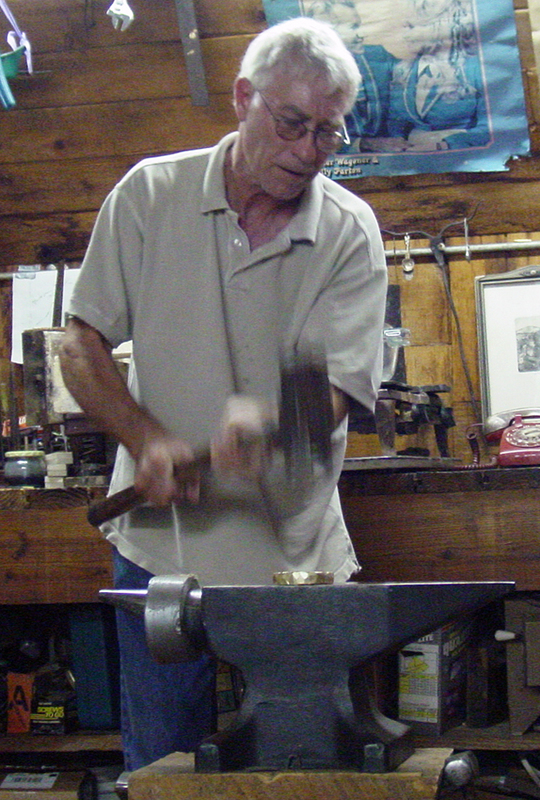 Gary Noffke hammering a 3-lb billet of 18k gold. 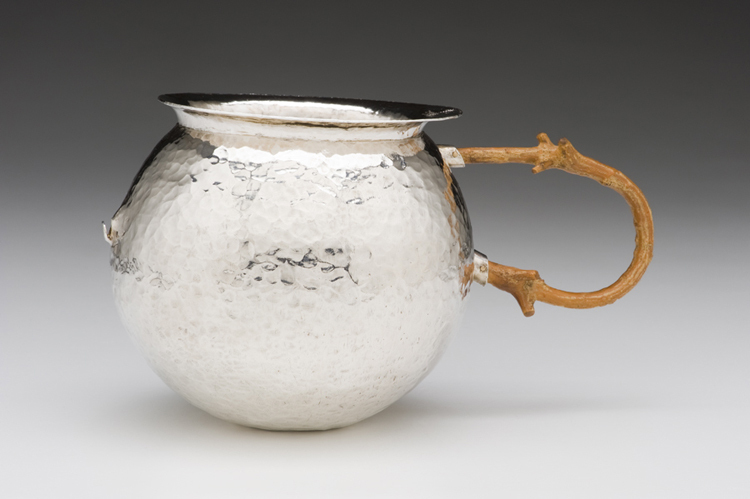 During a recent conversation, Noffke stated that one of the most important things about this teapot is that it is hot forged and raised from a billet of 969 silver. A billet is a metal casting that can be used for forging or milling to make sheet metal. Noffke’s billets, which look a little like hockey pucks, consist of 96.9% silver and 3.1% copper. He calls this combination his 969 alloy. He discovered in the 1990s, through trial and error, that this alloy allowed him to forge silver hot. So, why use a 969 billet and hot forge? By choosing to utilize a billet instead of sheet metal, Noffke can control the alloy as well as the thickness of the form with greater ease. He feels this gives his work more life and the undeniably handmade feel. However, hot forging the 969 alloy provides him greater expediency and gives him the freedom to work spontaneously. Noffke believes there is “just as much aesthetics in a bucket than in a goblet.”[vi] No matter the form, it is the quality of the work that matters. Noffke’s metalwork is distinctive and his forms are masterfully executed. These qualities are present in this stunning teapot in the Kamm Collection. Noffke’s passion for metal, coupled with his determined mindset has pushed his work and the field in new directions. There is no doubt that he has had a profound impact on future generations of metalsmiths and jewelers. Allie Farlowe offers a unique perspective on the life and work of Gary Lee Noffke. Not only is she a former student of his from the University of Georgia, but she also spent five years researching and developing his 2011 retrospective. 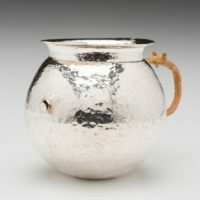 Organized by the Mint Museum in Charlotte, NC, this comprehensive exhibition called Attitude and Alchemy: The Metalwork of Gary Lee Noffke primarily focused on his work in silver, gold, and steel over a fifty-year period. Dunas, Michael. “Killing Time: The Work of Gary Noffke.” Metalsmith 7, no. 4 (Fall 1987): 32-39. Falino, Jeannine. “Gary Noffke: On His Own Terms.” Metalsmith, no. 5 (2013): 34-39. Oral History Interview, Archives of American Art, Nanette L. Laitman Documentation Project for Craft and Decorative Arts in America, 2010. [i] Michael Dunas, “Killing Time: The Work of Gary Noffke,” Metalsmith (Fall 1987): 34. [ii] Gary Noffke Phone interview. 10 August 2010. [iii] Gary Noffke. Phone interview. 10 August 2010. [v] Gary Noffke. Phone interview. 5 September 2017. [vi] Gary Noffke. Personal interview. April 2010.